Sailing club and Student Action for Accessibility were both approved as funded organizations during Wednesday night’s Student Senate meeting. 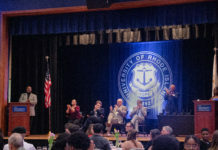 The Rhody Christian Fellowship was approved unanimously as an unfunded student organization, while Students for Sensible Drug Policy was denied as being a funded organization. These changes were part of Student Senate’s Student Organization Advisory Review Committee’s re-recognition process, which goes over status of group funding and the status of group recognition. Groups can be maintained as recognized, be put on probation or lose their recognition status. The student organizations undergo review from 10 members of SOARC and a finalized bill will be put forward two weeks from now to be voted on by the entirety of the Senate. The Senate went over a number of groups during a discussion period, which proceeded for close to an hour. SOARC Chair Samantha King mentioned that even after approval of the future bill, organizations can participate in the appeals process to fight for their funding or recognition status, which can be used to correct potential errors made by SOARC. The details of the increase aren’t set in stone, but be prepared to see a $900 increase for in-state students and a $2,000 increase for out-of-state students. Garcia is currently unaware of when the tuition increase will begin. On a more satisfying note, Garcia said that financial aid is expected to increase for students next year. President Cody Anderson will be working with the director of the Counseling Center, which has apparently been receiving some concerns from the student body. Anderson will also be working to get more information on the future tuition increase.